Stacey Gose is an Oregon women in agriculture who had a big problem; she could not find workwear that fit a woman but was tough enough to do the job, especially work gloves. So she started her own company, Tougher, which designs work gloves that fit a woman's hands and workwear that fits a woman's body -- and is not pink! Gose grew up in a farming family. She raised chickens and even did her own carpentry work. She wasn't happy with workwear on the market for women. As she refers to it, the “shrink it and pink it” options were of low quality and just not tough enough to hack the life of a rancher, and men's workwear didn't fit. Her company first began to design and sell tough work gloves for women. In 2015 while working on her master’s degree at University of Oregon’s entrepreneurship program, she started selling the leather work gloves online. 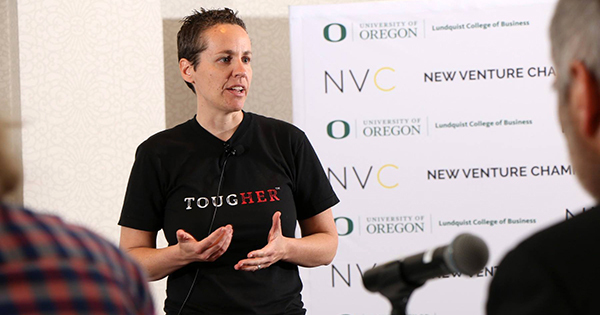 Tougher has now sold more than 300 pairs and is in five retailers in Oregon, including Naomi’s Organic Farm Supply in Portland. Gose plans to launch a Kickstarter in December to raise enough capital so she can add work pants to her line of workwear. Her goal is to raise $15,000 by selling 200 pairs of pants, but she is actually able to produce up to 600 pairs with a two-month ship date. The pants will sell for $75 and are durable yet designed to fit a woman's body. The pants are not just for women in agriculture; women in other industries like construction need something that fits and is made well enough to last, so the pants are certain to appeal to many women in tough, male-dominated fields. States Gose, “My hope is to be the brand home that spotlights that women do belong on those job sites,” Gose said.